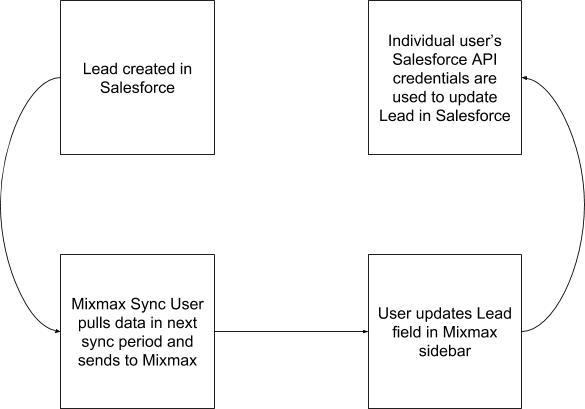 When you have multiple users connected to Salesforce from Mixmax, you’ll want to create a Mixmax Sync user. This will allow you to minimize the number of Salesforce API calls being made. Note that if you’re still seeing a large number of Salesforce API calls, you should think about using the Mixmax Real Time Sync Salesforce package which will drastically reduce the number of API calls being used to synchronize data between Mixmax and Salesforce. The Sync User is a designated Mixmax account and Salesforce account that are linked together inside of your Mixmax org. The Mixmax Sync User checks for record updates every 30 minutes via the Bulk API. Brand new custom fields are updated daily. As the Sync User retrieves data, that new data becomes available in Mixmax (i.e. in the Sidebar). All SFDC modifications made in the Mixmax UI (updates, deletions, creations) are made by the individual user in SFDC, with permissions respected, via bulk data and the REST APIs. Salesforce admin - Ideally, the Salesforce Sync User should be your Salesforce admin. User who has Modify All Data (MAD) permission in Salesforce - If you don't have a Salesforce admin, choose a user who has MAD permission. User who has access to all Salesforce records - If none of your organization members have MAD permission, choose the user who has access to all records. If the Sync User does not have access to certain records, Mixmax will not sync to or from these records. To set up your organization's Salesforce Sync User, go to the Integrations section of your Account & Billing page. Enter the email address for your Salesforce Sync User. To change your Sync User, go to the Integrations section of your Account & Billing page, and add the email address of your new Sync User. 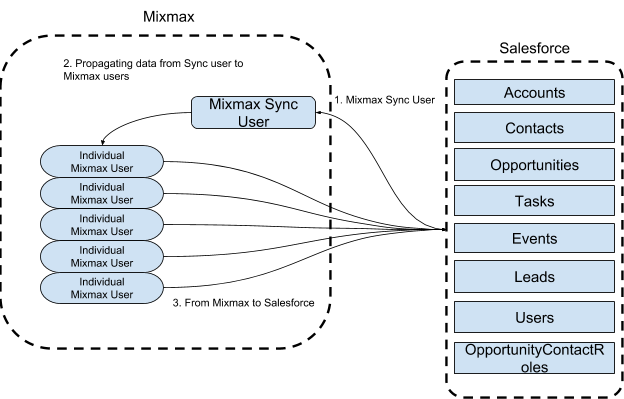 The Sync User must have a Mixmax account on the Growth plan or above. If your Sync User disconnects from Salesforce, Mixmax will automatically designate a new Sync User, using the criteria above, and we will send an email to the organization's admin to notify them of the change.